This is the perfect time of year to curl up with a Katie Fforde novel. The temperature is hovering around six degrees (brrrr… I’m still wearing my coat and fingerless gloves inside the house) but I’m sure that spring can’t be far off. 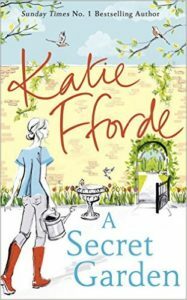 The days are longer, the first daffodils have appeared and Katie Fforde’s latest book has hit the bookshops. A Secret Garden, Katie’s 23rd novel, is as fresh as the morning dew. Dedicated to “women who garden, everywhere,” it’s the enchanting story of three friends from different generations. Talented gardener Lorna, a divorcee with a grown-up son, lives and works on a country estate while twenty-something Philly runs a smallholding with her eccentric grandfather. And then there’s the formidable Lady Anthea, whose bark is definitely worse than her bite and who can always be relied on to roll up her sleeves, organise her friends and pour everyone another glass of wine. Katie Fforde is brilliant at creating likeable characters, the sort of women you’d like to be your new best friends. Then again, I was very taken with Philly’s grandfather Seamus. His daughter dismisses him as “pretty much a delinquent in many ways” but he makes cakes, is a dab hand at fixing cars and has a heart of gold. As always, Katie’s publisher, Century, has come up with a stunning cover. Illustrated by Jacqueline Bisset, it’s intriguing, captivating and full of the joys of spring. Just like the novel itself. PS. Katie Fforde’s previous novel, A Summer at Sea, is out in paperback now. Read my review here.